When Will My Puppy Stop and Start Teething? Just like human babies, ​puppies have baby teeth that fall out. Most puppies are born without teeth and go through a process known as puppy teething. From birth to six months, sharp puppy teeth erupt from the gums in the jaw in a predictable timeline. 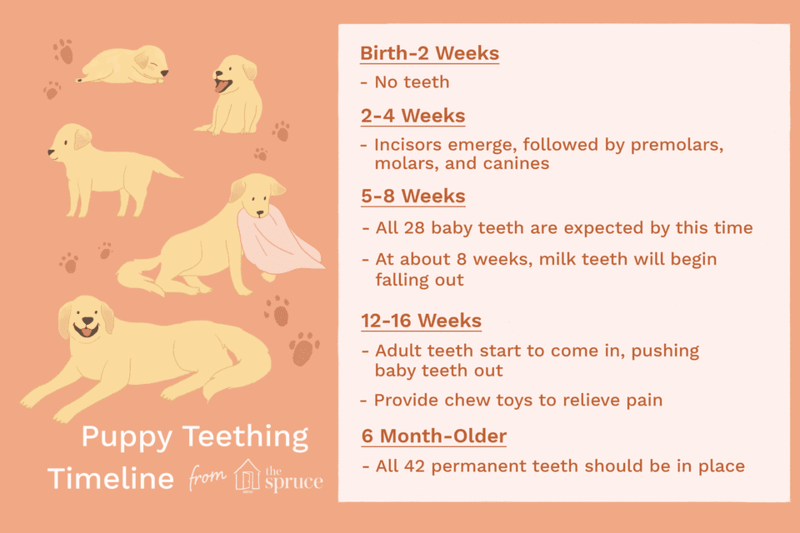 Puppies go through various teething stages including early and temporary teeth (deciduous or "milk teeth"), sore gums, and eventually—the growth of 28 baby teeth. During teething, puppies may target all kinds of unexpected objects to gnaw and chew on, like baseboards and shoes, to relieve the discomfort. However, most dogs never outgrow the urge to chew. Pet owners are encouraged to learn about how their puppy's teeth grow in so they can best handle their dog as it ages. When your puppy is born, there are no teeth yet. During the first two weeks, you'll notice your puppy nursing and first opening its eyes. This is a good time to take your puppy to the veterinarian to do an introductory health check-up, introduce socialization, and get it used to the experience. In the front of the mouth, narrow-edged teeth known as incisors will begin to emerge. The incisors are the first to appear at about 2–3 weeks of age. Puppies have six incisors on both the top and bottom jaw. Premolars and molars also begin to grow behind canines (the pointed teeth between the incisors and premolars) at 3–6 weeks of age, with three on the top and bottom of each side. Four needle-like canines appear at age 4 weeks and frame the incisors, one on each side, top, and bottom. The last molars appear by 6–8 weeks of age. 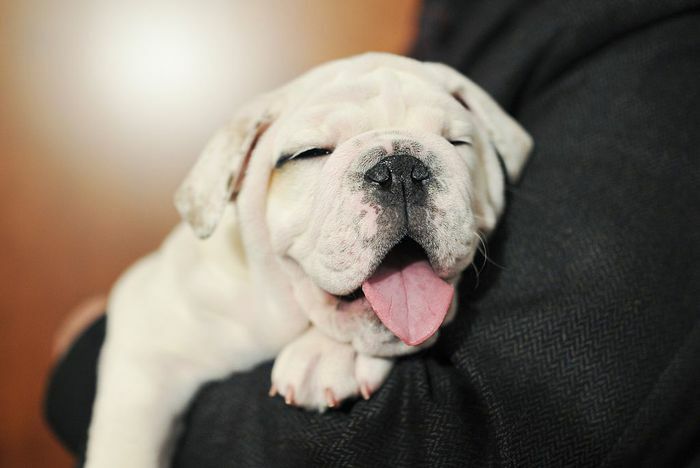 At about 8 weeks, the puppy’s permanent teeth begin pushing out deciduous or "milk teeth." The roots of the baby teeth are absorbed by the body, and in most cases, milk teeth simply fall out. When the deciduous teeth don't fall out on time, puppies may appear to have a double set of teeth. Retained baby teeth should be extracted by a veterinarian so that permanent teeth have room to grow. Sometimes, a crowded mouth pushes teeth out of alignment, resulting in difficulty eating or poor dental hygiene (which can lead to periodontal disease). All of your puppy's 28 baby teeth are expected to come in by this time. This is when puppies start to learn how to eat moist and soft puppy food. Breeders often let their puppies go to their new owners' homes around 8 weeks. Baby teeth will begin to shed, and permanent adult teeth will start to come in. This process is painful for dogs, so providing puppy safe chew toys is recommended. This is a good time to socialize your dog more, look and touch the inside and outside of its mouth, and prepare for teeth brushing. At this point, all puppy teeth should be gone, and adult teeth emerge. If there are any baby teeth left, let your vet know so it can be removed. Permanent teeth replace the milk teeth tooth-for-tooth and add four premolars and 10 molars. Most pups will have 42 permanent teeth in place by about 7 months of age. 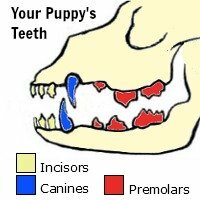 Two teeth occupying one spot in your puppy's mouth. This can cause the adult tooth to come in crooked, possibly causing later problems. Spots of blood on your dog's toys, brown tartar on the teeth, or gums that are bleeding, inflamed, and/or sore. These are common symptoms of periodontal disease, a large oral issue for dogs. Broken or cracked teeth. This can cause the nerve of the tooth to expose itself, causing your dog pain or infection. Crooked teeth or malocclusion (a misalignment of the upper and lower jaw). While some breeds have a trademark bite, unusual ones could cause chewing issues. Loose adult teeth. Most often, this is caused by trauma to the mouth or from gum loss due to advanced periodontal disease. It could also be a sign of illness. Schedule a visit with your veterinarian for an initial dental exam for your puppy. This examination will include a look at the teeth, gums, and oral cavity. Ask your vet to demonstrate how to clean your pup's teeth. This way, you'll know what brushes, toothpaste, and techniques to use. Get your pup used to the idea of tooth brushing around 6 months when its adult teeth start to come in. Regular brushing will prevent plaque, stinky breath, disease, and other medical problems. It's ideal to brush your puppy's teeth daily, but once or twice a week will work. Dogs use their incisors to rip and scrape meat from bones. They also use them as a grooming tool to nibble burrs or dirt from their fur. Dogs use their two canine teeth, found on each side of the jaw (on the top and bottom), as pointed daggers to inflict stabbing and slashing wounds. Dogs have eight premolars in the upper jaw and another eight in the lower jaw. They also have four molars in the top and six in the bottom. The extra molars are designed to crush and are used to process vegetable foods and bones. Dogs have specialized carnassial teeth composed of premolars and molars. As they pass each other during the mouth's closure, these teeth act like scissors. The carnassial teeth are innovations of the carnivorous animal that requires shearing action to process flesh. The lower canine teeth are situated in front of the upper canines. The upper incisors overlap the lower incisors. The upper premolar points fit into the spaces between lower premolars. The upper carnassial teeth overlap the lower ones. Malocclusion refers to the abnormal "bite" or fitting of these teeth. Malocclusion can be normal for certain dog breeds due to differences in the shape of the jaw and mouth. For instance, the flat-faced (brachycephalic) dog breeds like Bulldogs have a normal malocclusion because their lower jaw is longer than the upper. However, this allows the teeth to fit incorrectly, which can cause mouth damage as the dog chews. Thus, a veterinarian or veterinary dentist with orthodontic correction should be aware of malocclusion.